Established in 1922, JR Elix Tanks was then known as AH Elix Tanks, with the business starting by an eager young sheetmetal tradesman, Arthur Elix. In common with many other great successful Australian businesses, we have our roots in a strong family tradition. Our humble beginnings were always in Mannum, however we operated out of a small shed with no power and no phone, even up to 1968. Arthur’s wife Irene supported him in the business and later their sons Peter and Sam. 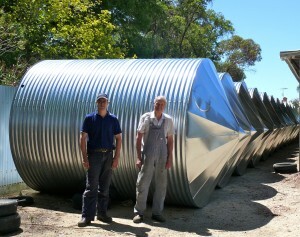 Peter Elix reinforced our name in South Australia as a leading water tank manufacturing and installing business, particularly in the household range of galvanised corrugated iron round water tanks up to 18000L. He operated this business between 1972 and 1996, and from there John has been keeping up the legacy of Peter and Arthur. The company has continued the family tradition John and wife Nicole at the helm with vital corporate inputs from Peter and wife Ruth. The company has developed from its early concentration on tank manufacturing to the current much wider scope including general engineering, contracting, general sheetmetalwork, shipping container modifications and fit outs, roofing, fencing, tree felling, yard maintenance and manufacturing and installing throughout SA built onsite large volume rainwater tanks, while still manufacturing and installing the household Galvanised and Aquaplate water tanks. We are currently a third generation going concern, with many changes to our processes and buildings over the years to keep abreast of modern technologies. 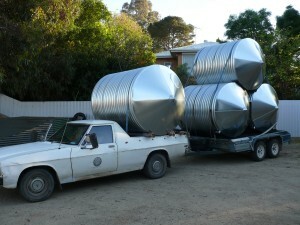 We have always built our tanks out of Bluescope Australian made corrugated galvanised iron, so why change a winning formula? The Elix Tanks approach continues to be the provision of high quality water tanks to South Australia, and now with the addition of our new large capacity range, we will continue to service SA with high quality water tanks.